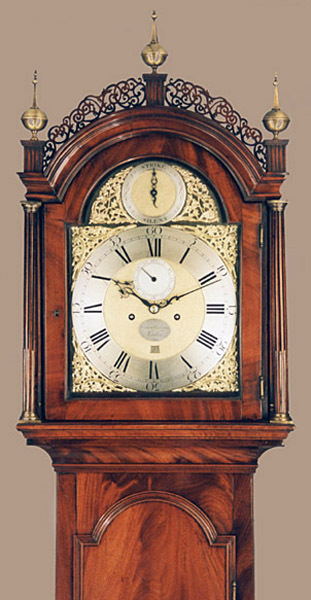 Edmund Prideaux of London Longcase Mahogany Circa 1780 - Height 94in. 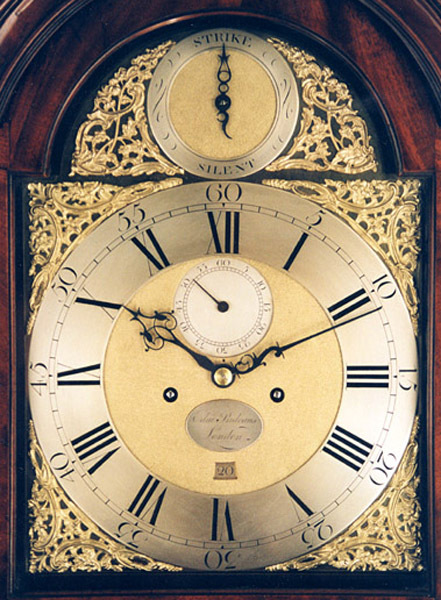 This Longcase Mahogany's Maker - Edmund Prideaux of London recorded 1743-90. (A watch movement by him in the famous Buckley collection). Rich, flame mahogany veneers in a classic late 18C 'London' case of superb proportions. Pierced and fretted top, typical 'London' two step base and brass reeded hood columns. 12" breakarch brass dial with strike/silent to arch, subsidiary seconds dial, and square date aperture above 6 o'clock position. Finely matted centre. High quality, 5 pillar movement with hourly (rack) striking on a single bell. 8 day. Edmund Prideaux of London recorded 1743-90. (A watch movement by him in the famous Buckley collection). 94" (239 cms) or 89 1/4" (227cms) ex finial.